Today the dioceses in the United States celebrate the memorial of St. Frances Xavier Cabrini, virgin, born in Lombardy, Italy, one of thirteen children. She came to America as a missionary, founded the Missionary Sisters of the Sacred Heart to care for poor children in schools and hospitals. She is the first American citizen to be canonized. December 22 is her feast day in the Extraordinary Rite. Today is the feast of St. Agostina Petrantoni canonized by St. Pope John Paul II on April 18, 1999. Her feast is on the Italian Liturgical Calendar. According to the 1962 Missal of St. John XXIII the Extraordinary Form of the Roman Rite, today is the feast of St. Didacus, a humble Franciscan lay brother and the recipient of exceptional graces. He received such light from God that he spoke of heavenly things in a manner almost divine; certain miracles, but especially his obedience, charity and fervor of his prayer, caused him to be considered a saint wherever he went. He was born in Andalusia, was sent as a missionary to the Canary Isles, spent some time in Rome and returned to die in Spain. This saint, the first United States citizen to be canonized, was born in Italy of parents who were farmers. She was the thirteenth child, born when her mother was fifty-two years old. The missionary spirit was awakened in her as a little girl when her father read stories of the missions to his children. She received a good education, and at eighteen was awarded the normal school certificate. For a while she helped the pastor teach catechism and visited the sick and the poor. She also taught school in a nearby town, and for six years supervised an orphanage assisted by a group of young women. The bishop of Lodi heard of this group and asked Frances to establish a missionary institute to work in his diocese. Frances did so, calling the community the Missionary Sisters of the Sacred Heart. An academy for girls was opened and new houses quickly sprang up. The saint, frail and diminutive of stature, showed such energy and enterprise that everyone marveled. She crossed the Atlantic twenty-five times to visit the various houses and institutions. In 1909 she adopted the United States as her country and became a citizen. After thirty-seven years of unflagging labor and heroic charity she died alone in a chair in Columbus Hospital at Chicago, Illinois, while making dolls for orphans in preparation for a Christmas party. Cardinal Mundelein of Chicago officiated at her funeral and in 1938 also presided at her beatification by Pius XI. She was canonized by Pius XII in 1946. She lies buried under the altar of the chapel of Mother Cabrini High School in New York City. — A Saint A Day, Berchmans Bittle, O.F.M.Cap. Patron: hospital administrators; immigrants; orphans. If you live in or pass through Colorado, visit the western Mother Cabrini Shrine. Read more about St. Francis Cabrini. Prepare an Italian dinner in honor of St. Francis Cabrini. For dessert make a ship cake (symbolizing her missionary work), a heart cake (she founded the Missionary Sisters of the Sacred Heart) or a Book Cake (symbolizing her founding a religious order). Say the Little Rosary of St. Francis Xavier Cabrini. Read the Encyclical, On Consecrated Virginity, by Pius XII and if you are single consider the possibility of a vocation to this life. Read the Pope Benedict XVI's Address for World Day of Migrants and Refugees, 2007. If you know someone who has immigrated to this country, try to help them feel welcome, perhaps by inviting them over for the Italian dinner. Didacus (or Diego, Jacob) was born in the town of San Nicolas, Andalusia. From early youth he showed a love for solitude. At Arrizafa, near Cordova, he became a Franciscan brother and was outstanding in humility and obedience. He had little formal education, yet through divine enlightenment in no way lacked wisdom. As a missionary he visited the Canary Islands and was appointed first superior of the new foundation there. In 1450 Pope Nicholas V confided to his care the sick in the celebrated convent of Ara Caeli. With his tongue he often cleansed the wounds of the sick. He miraculously healed many with oil from the lamp which burned before a picture of the Blessed Virgin or with the sign of the Cross. During a stay at the friary at Alcala in 1463, Didacus felt the approach of his last hour. Wrapped in discarded rags, with eyes fixed immovably upon a crucifix, he died while fervently praying the words of the hymn Dulce lignum, dulces clavos, O sweet wood, O sweet nails that held so sweet a burden! For a long time his body remained incorrupt. — The Church's Year of Grace, Pius Parsch. Patron: diocese of San Diego, California; Franciscan laity; Franciscan lay brothers. Symbols: Bread and roses in a tunic; cross held by an angel. Meditate on the fact that in order to walk the Christian path you must always be counter-cultural, for the world follows the broad, level and easy roads, and resolve to bear patiently the next time someone misunderstands you or even ridicules you because you do not conform to this world (pray for that person); Pray for the virtue of humility which we must have if we are to reach our "enemies". The son of a Polish senator, St. Stanislaus was first privately educated at the family castle. He later attended the Jesuit college in Vienna, where he set a holy example for all. While at the college, Stanislaus suffered from a serious illness. St. Barbara and two angels appeared to him and he seemed to be given Holy Communion in the vision (either by St. Barbara or by the angels). Also, Our Lady visited him and told him that he would recover and become a Jesuit. The Jesuit provincial in Vienna was too afraid of making Stanislaus's father angry to admit Stanislaus to the Order, so the saint walked to Augsburg and then Dillingen, a total of 350 miles, and there appealed to St. Peter Canisius, the Jesuit provincial of Upper Germany. St. Peter Canisius took him in, and after three weeks, sent Stanislaus to Rome to see St. Francis Borgia, who was general of the Jesuits. In Rome, Stanislaus became a Jesuit at the age of 17, much to the dissatisfaction of his father. His devotion to the Eucharist was apparent to all, since he went into ecstasy after receiving Communion. St. Stanislaus became ill again and died only nine months into his novitiate. 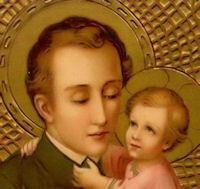 Read more about St. Stanislaus Kostka and find additional prayers here. At St. Stanislaus Kostka Polish Catholic Parish read about the Patron Saint of Holy Disobedience. The life of Saint Agostina is an example of the virtue of silence that is found in one's duties, charity, of quietness in one's approach rather than the absence of speech. Sister Agostina died a violent death, at the hands of one of the patients in the hospital where she labored for God. When she was beatified this was noted, but it was her peaceful way of helping the poor who were sick that is most remembered. She is not a Martyr in the usual sense, because she was not killed for her Faith. She was one of ten children – the second born – in a family of moderate means and rich in the practice of the Faith, including the daily Rosary. She attended school as best as she could but had to be absent frequently in order to help her mother because her father was very ill, almost crippled with arthritis. She was learned and bright and was nicknamed "the professor". At the age of seven she had to work to help the family's income. Not only did she tend the cattle and help with her younger brothers and sisters, she made shoes, worked on olive harvests and for four years salved away helping to build a road for little pay, all with a cheerful disposition, without complaint. Livia was modest, retiring, very quiet, but popular and often asked for advice. The budding Saint was pretty and had suitors who had no hope. One of the young men, who attempted to propose to her was met with Livia's enthusiasm for Jesus. She took out a holy card with His image and said: "Here is the One I will marry." 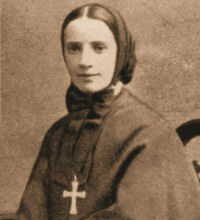 In 1866 she entered the novitiate of the Sisters of Charity of St. Joan Antida, the Rome convent. There she found that the hardest task was that all she did for Jesus was too little in her estimation; there was never anything she would refuse her Spouse. She took the name of Sister Agostina and was assigned to the Hospital of Santo Spirito, which had become far too secularized over the years. Crucifixes had been removed from the wards; one of the rules imposed on the sisters was the ban on mentioning so much as the name of God to their patients! This did not deter her because she did not need words to tell others about God; her actions were so imbued with the love of God and neighbor that her patients grasped everything she was teaching them. She had as yet to make her final profession, having come down with tuberculosis, she received Viaticum and then recovered. It was then that she requested to work with tubercular patients since she was already infected. This ward held a number of unruly men, some of them convicts. They blasphemed and sputtered vulgarities. She never failed to be patient and cheerful. Her consolation and inspiration during this time was Our Lady. She had a great devotion to the Mother of God, her favorite prayer was the Rosary. In her charming, silent way, she would write letters to the Saint Virgin and place them behind a picture by way of a mailbox. One of these contained the following: "Most Holy Lady, convert that wretched man whose obstinate heart I am not able to change and I promise to do two or three extra night duties in your honor." Sister Agostina, given the chance, chose work over rest. The night before she died, she said: "We will lie down for such a long time after death that it is worthwhile to keep standing while we are alive. Let us work now; one day we will rest." In September of 1893 Sister Agostino professed her final vows and went back to the same ward to nurse. One of the men who had been sent from a prison, a Giuseppe Romanelli, had a mother and sister who visited him. Our Saint was very kind to them. He was so troublesome in the ward that he was sent away; thereafter he wrote threatening notes. On November 13, 1894, Sister Agostino and another patient were going down the stairs of the ward, only to find themselves face to face with this four times condemned man. Romanelli wielded a knife and stabbed her several times. The patient hollered for help, but by the time it came St. Agostina was on the floor dying and saying, "Blessed Mother, help me." She was taken to a bed, no longer able to speak. Her superior asked her if she forgave the murderer, who had escaped. She nodded, Yes. She was smiling. A few moments later she had died. Two days later her funeral was held, the same day that her killer was arrested. He was sentenced for life although the Saint's family asked for mercy. He repented, received the Last Sacraments, then died in prison a year later. The process for Sister's cause begun in 1936, the first decree was in 1945 and she was beatified in 1972 and canonized in 1998. Please read more about St. Agostino at the Vatican Website and at the Sisters of Charity.